Having your kitchen cabinets spray painted is definitely an investment in your home and not one to be taken lightly. We can make your kitchen dreams come true, whether you are thinking of a deep dark chocolate brown island and creamy white doors or sleek steely grey with antique brass hardware or bright white cabinets to show off your beautiful quartz counter tops — We can make it happen! What Makes A Kitchen A Good Candidate For Spray Painting? Why Should You Have Your Kitchen Cabinetry Painted? There are many stages and elements to consider when creating your dream kitchen. 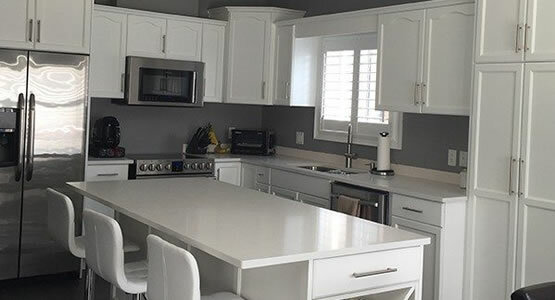 Painting your cabinetry is just one aspect and we would love to visit with you in your home and hear about the vision you have for your kitchen. We can offer ideas we’ve seen in other homes, talk about trends, colours, countertops, hardware and flooring and more! We also can talk about our process, timelines and what you can expect from your new spray painted kitchen. Share your dream with us, we are only limited by our imagination!